Do you love wind chimes? I do and I'm very fond of collecting them. I have some as souvenirs from friends and I keep them all no matter how old the chimes are. My favorite is the chimes from Cebu made of various colors of capiz materials shaped into variety of fishes. Another is made of steel with love birds on top which chimes so beautifully especially when there's breeze. Well all of my chimes were bought from certain places and not one of them were home made. 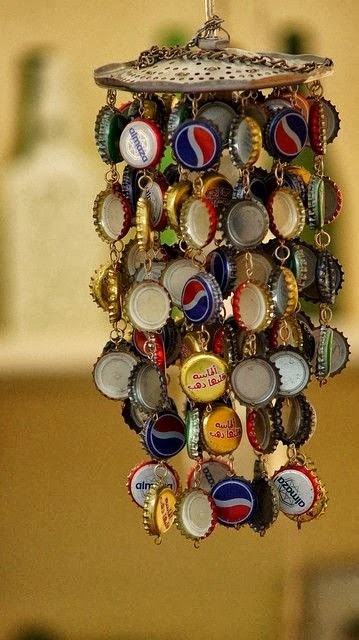 Now I just happened to pass by this concept of using bottle caps as wind chimes. I find so nice as it's not only functional and unique but inexpensive as well. You don't need a lot of money to do it. One must only need patience and style and wind chimes will be on it's way. So creative!